Welcome to Water’s Edge, a brand-new 4-bedroom waterfront villa located in the Rodney Bay Marina. Guests staying here will have access to the Bay Garden Beach Resort and Spa which is a 5 minute walk from the villa. Modern, spacious, stylish – Water’s Edge Villa is brand new and ready to accommodate guests in state-of-the-art lodgings with aplomb and ease. The design of the villa is contemporary and minimalist, sheer white walls and flat rooves forming a symmetrical appearance. To the rear, as you step out onto the sun deck with both shaded and exposed areas, a private swimming pool sits, surrounded by sun loungers, the perfect arrangement to cool down after some sun-bathing in the tropical climate. A landscaped garden with tropical plants native to the island provides both a glimpse of the greenery that covers most of the island in rainforest, while simultaneously offering privacy to guests from neighbouring properties. Beyond that, a private boardwalk offers spectacular views of the surrounding marina. Inside, the décor has light accents of the villa’s surroundings informing the colour palette; gentle pastel greens and deep ocean blues are scattered within the sandy beige of the floors, walls and furniture, lending a bright and airy feel to the property. A generously sized lounge, dining room and kitchen are combined into an open plan space, spanning from the front of the villa to the rear, with plenty of light flooding in from both ends. The lounge hosts a large L-shaped couch with reclining seats, with several large comfortable cushions to sink onto. A glass-topped coffee table rests within the crook of the couch, and no matter where you place yourself, a perfect view of the widescreen TV mounted on the wall is easy to obtain; no one need argue over who sits where when it comes to watching a movie. The elegant dining table hosts eight people, white tall-backed chairs arranged around it. Adjacent to the dining area, the kitchen, fully equipped with state-of-the-art appliances, utensils, a breakfast bar and sleek cabinetry, makes for an efficient workspace. With the use of local produce, guests can sample the culinary delights of Caribbean cuisine, without having to leave the comfort of the villa. Alternatively, if you fancy a night out on the town, there’s a plethora of fine eateries and restaurants that offer taste sensations without the prep work, both with authentic Caribbean recipes and more international dishes to cater to every taste. Located upstairs in the villa, the bedrooms continue the trend of beach-inspired décor; greens and blues that are reminiscent of sea glass decorate the luxurious beds and bedding, alongside the soft furnishings of the room. Air conditioning and ceiling fans ensure that pleasant air flow and regulated temperatures are at the optimum level for a peaceful nights’ sleep. Each room is afforded its own en-suite bathroom, complete with walk-in shower, to wake up fresh in the mornings or cleanse away the days’ activities in the evenings. 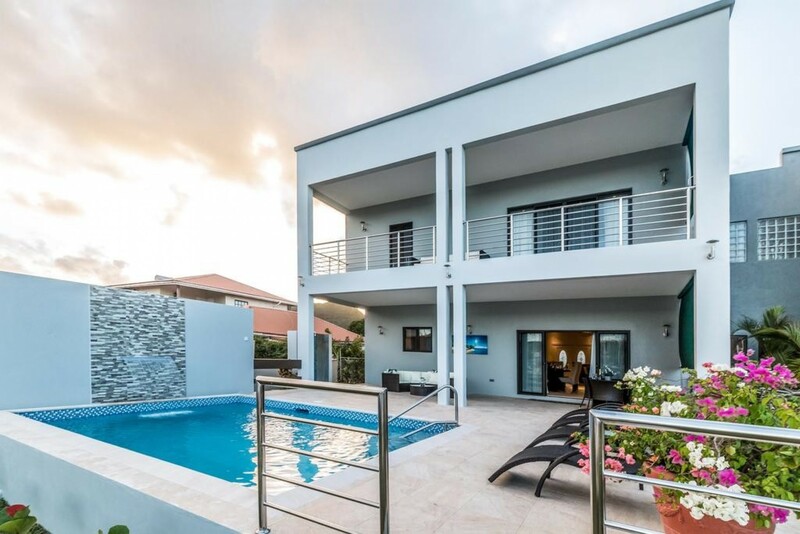 Located on the north side of St. Lucia, overlooking Rodney Bay Marina, Water’s Edge Villa is within the Rodney Bay Village. Guests will find themselves spoiled for choice, as all resort facilities are made available to all who stay in Bay Garden, including the gym & fitness center and full-service spa. Clustered around the resort, pubs, clubs, duty-free shops and restaurants are in ample supply, many just a few minutes’ walk from door to door. A vast array of restaurants with international cuisine ensures that everyone’s tastes are catered to. There are many beaches up and down the coast of St. Lucia to explore, however Reduit Beach is the most accessible, being just a few steps away from the resort, and approximately 5-minutes from your residence. Water sports are part and parcel of the St. Lucia experience, especially the Splash Island Water Park (50m) that is visible from the resort, floating in Rodney Bay, alongside a plethora of other activities to choose from, including kite-surfing, sailing, surfing, diving and many others. Further afield, visit the impressive Piton Mountains to the south (51.8km) in the Soufriere region, where Sulphur Springs and the Soufriere Drive-In Volcano reside, sure to be like nothing you’ve ever experienced. Rodney Bay is one of the most famous yachting destinations in the Caribbean. There is a beautifully landscaped Marina with restaurants, bars, shops and galleries. The Bay is worth visiting during the day to browse through the shops and enjoy a waterside lunch or at night when it becomes lively due to the many night time venues.